Derrick Adams, Fight or Flight, 2017, mixed media collage, 48 x 72 inches. 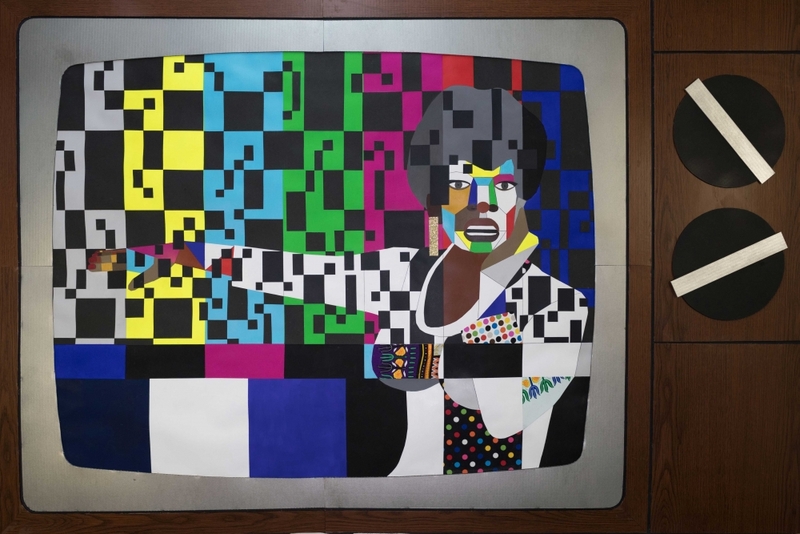 An astute observer of popular and visual culture, Derrick Adams continuously collects patterned cloth fabrics, vibrant colors, and design elements from his familial and urban environment. 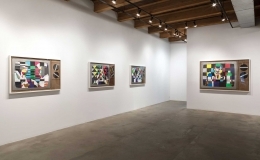 In the studio he pulls together assorted imagery into mixed-media collage, sculpture, and performance that speaks to the diverse American urban and visual landscape. 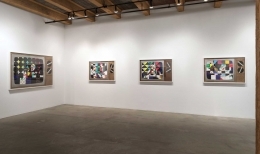 The new collage works in Tell Me Something Good resonate with the aesthetics of popular culture and also retain deeper references to artists like Romare Bearden and William Johnson as well as art historical movements of Geometric Abstraction, Pop Art, and Performance. 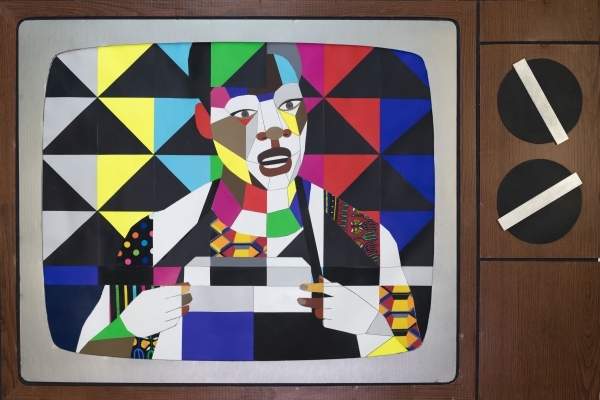 An interdisciplinary artist who works in drawing, collage, painting, sculpture, video, and performance, Derrick Adams received a MFA from Columbia University in New York and BFA in Art & Design from Pratt Institute in Brooklyn. 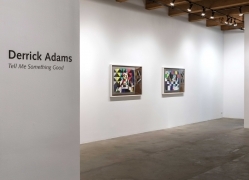 In 2016 Derrick Adams received the Studio Museum’s prestigious Joyce Alexander Wein Artist Prize; he is the recipient of a 2009 Louis Comfort Tiffany Award, 2014 S.J. Weiler Award and an honored finalist for the William H. Johnson Prize. 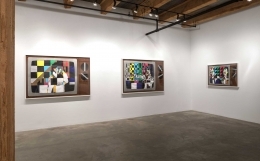 Derrick Adams has exhibited nationally and internationally with Rhona Hoffman Gallery, Anne de Villepoix, Paris; Vigo Gallery, London; Tilton Gallery, New York. 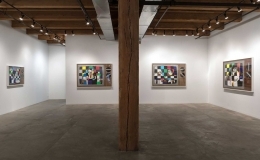 Institutional solo, group, and performance exhibitions include Greater New York at PS1 MoMA, Queens; On at Pioneer Works, Brooklyn; Tete-a-Tete at Aperture Foundation; Performa biennale; Studio Museum in Harlem; Brooklyn Museum, Bowery Poetry Club, The Kitchen, and Performa Hub, New York. 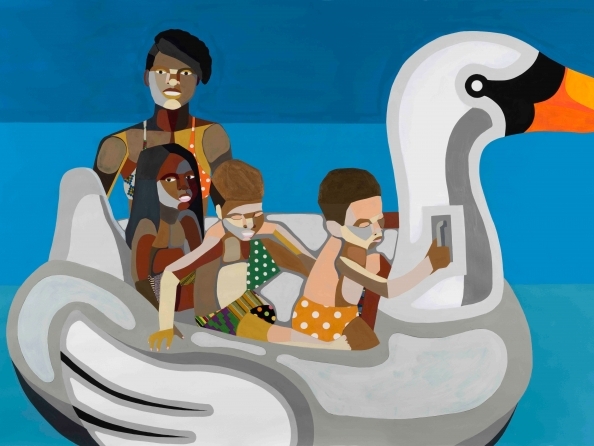 Derrick Adams has upcoming solo exhibitions at the California African American Museum and Studio Museum in Harlem. 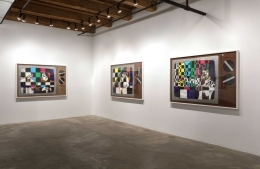 Review of Live and in Color at Rhona Hoffman Gallery.